After my first try at one of Garth Williams’ beautiful illustrations in the children’s classic, “Charlotte’s Web”, I was looking for another to try for the letter I. Then I flipped back to the cover, and thought I’d have a go at something with color! I’d originally intended to sketch this in pencil first, and then go over it in ink and erase the pencil. But as I began, I could see an endless road of fussing and erasing….so I decided instead to measure where Fern’s arm started and stopped, and where the lamb’s head ended, how far up Wilbur’s snout started and use those as guides, and then go right in with the ink. I’m really liking the marriage of Mr. Micron to Ms. Watercolor. A match made in heaven! I enjoyed doing this. It was a nice happy childhood memories revisit, too. I think ink really has found its way to my artwork, for real. It is always scary, because I know there’ll be lots of errors I won’t be able to fix, but there’s a certain freedom in that, too. You get tangled up? Just tango on. That’s what Colonel Slade said, and I think he’s a wiser one than most of us. Happy Friday eve to all! I hear the music starting…. Wow! Well done. I’m always for plunging right in myself. Thanks! I need to adopt those bold attitudes; I’m always hesitant to work with non-erasable materials. Well done! I love the ink/watercolour pairing too. OOOOO MMMMMM GGGGGEEE! outstanding! This looks so hard to me and you are so good at it. Amazing job!! Thanks, Jodi! I bet you used to say watercolor was hard too! I resisted ink for a long time. You never know until you try. Lol, maybe that’s why I seem to try everything. Looking to see what fits. You do have a point there, cutie! Looks Lovely! Love your delicate, sensitive line work and your beautiful watercolours. Hmm, was just looking at one of my pan sets of watercolours today; I love using them with a black fineliner pen too. Think, I’ll do something with them again soon. 🙂 All the best, Janette. Haha, better not tell Hub you said that lol! Thanks, Jean, you make me feel like a rock star artist, as always! Laura, good for you for trying something new. Your Charlotte’s Web rendition is so charming. Watercolor and Pen are the perfect match. I look forward to seeing more art exploration. Have s great weekend. You do the same, Sharon, and I’m so glad you liked it! Ok…this is my favorite so far! It’s really good! Nicely done! What a great illustration and a great story. Thanks so much, Lance; I so admire your work! I’m glad you liked this one. This looks really great. Thanks for posting. Fabulous rendition of the original! I like yours better than the original ~ matching your sketching with your painting is so wonderful. Enjoy seeing this! Pairing the two is quite a natural thing to do … Urban Sketchers, illustrators, designers, artists have been doing it like forever. Glad you are liking the combo. Mixed media. Cheers! 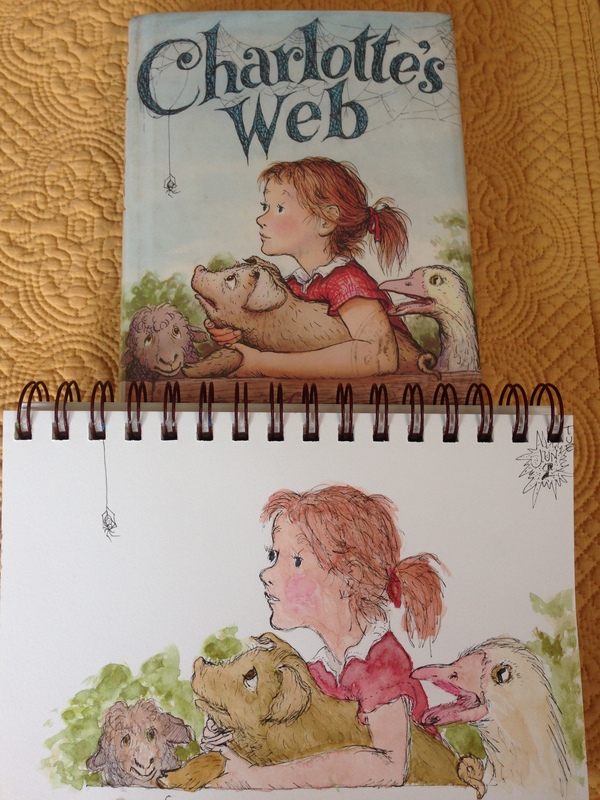 It’s all new to me, still, or at least feels new, and I don’t think I really ever noticed that the cover of Charlotte’s Web was actually done this way. I never really saw or noticed anything until I started drawing, I don’t think. It’s like taking the blinders off! 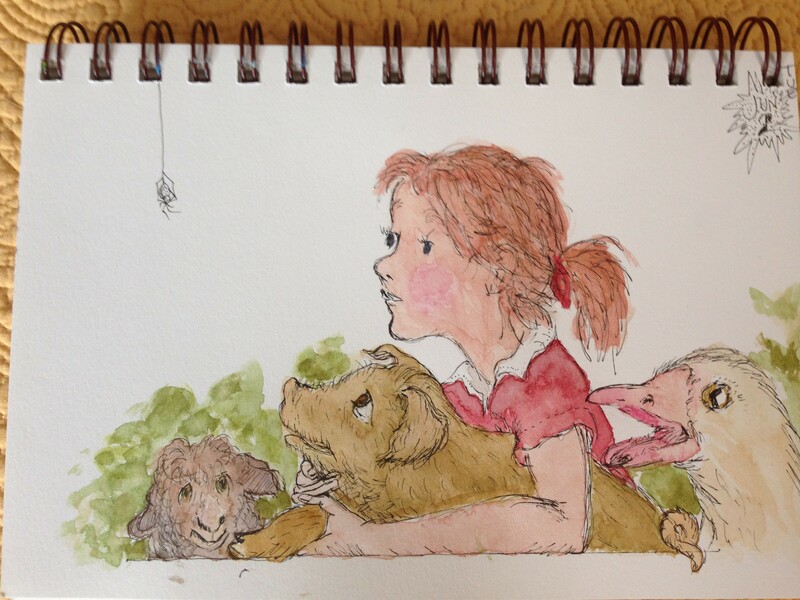 Beautiful illustrative work – great control over the ink lines and watercolor. Enjoyed seeing your process. You’re a wonderful artist, no surprise on my end! This is beutiful! I like Wilbur especially. You captured his character so well. Your drawing is perfect. One of my favorite stories. I read it again last year and it still makes me cry. Thank you so much, Jill!! I’d really like to do more….I need more covers! Or maybe I could take another of the illustrations inside and just add my own colors? What do you think? I’d like to try other books I read as a kid. I was thinking maybe Winnie the Pooh? Ooh Peter Rabbit!! Can you think of any others? Thanks, Jill! Every day is another mystery in this journey…. This drawing is amazing! 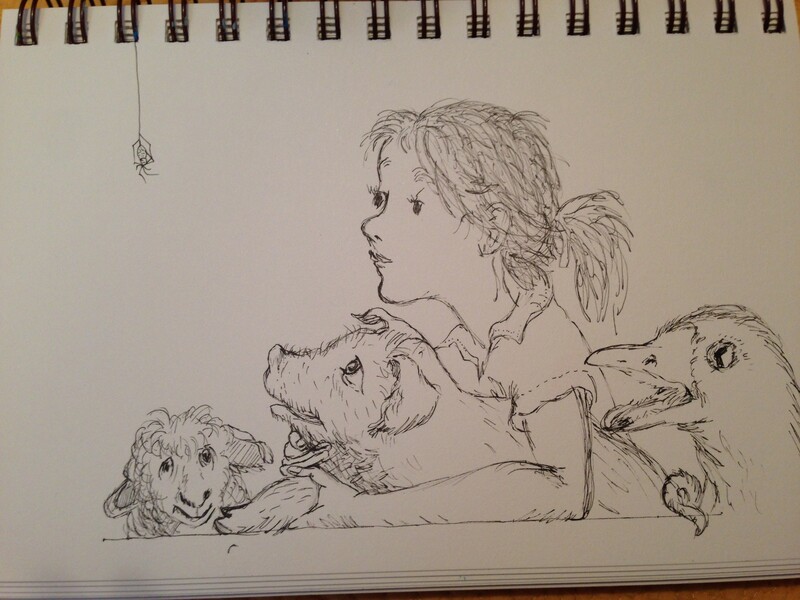 I remember reading Charlotte’s Web and also watching the animated movie. It’s a beautiful story. Hey Laura – great measurement and use of your landmarks! Impressive result. You have such a nice approach to everything you do. Honest, Free. Joyful. Always enjoy seeing your work. Wow, Tom. Thank you so much. Definitely one of my favorite comments ever. Thanks for taking the time to say that. I really appreciate it. Really perfect! This speaks so highly. Drawing is seeing. I totally believe that copying is such a great way to learn and grow as an artist. I have a notebook full of my favorite characters copied from when I was a kid. Thanks for the inspiration to get back to copying some of my favorites today. You’re welcome, and I’m so glad you liked this! I have checked out other books and I’ll be drawing some from them, too. Ink and watercolor together…..can’t think of a better medium marriage than that. Thought I should drop by, and let you know I’ve said a few words about you and your lovely blog, on a post I just published. 🙂 The link I put in, to your blog, goes straight to this post. Have a great day. Thank you so much! I’m very happy for this connection. I am really looking forward to being inspired by your gorgeous colors and the humor in your work as well! I’d love to be a whimsical watercolor painter. We’ll see if that ever happens lol. Thanks again for the follow and for your visit and comment! Awwww thank you, Fabio, for that kind comment. I’m so grateful. Thank you. I hope you have a wonderful week! I’m just catching up with your blog and love this, it’s fabulous. I think that pen and watercolour are a great combination. Great point, and thank you again Tori!